Published: November 26th, 2018 by Simon. Filed in Tiles and tagged outdoor tiles. Tiling is the ideal flooring option for outdoor living areas such as balconies, patios and poolside decks. Tiles come in a wide range of textures, patterns, colours, and styles and can really help to bring the ‘wow factor’ to an outdoor space. That being said, there are certain things that you should keep in mind when shopping for outdoor tiles in Perth, like the fact that not all tiles are created equal. Standard tiles are for indoor use only and are usually not suitable for outdoor applications. 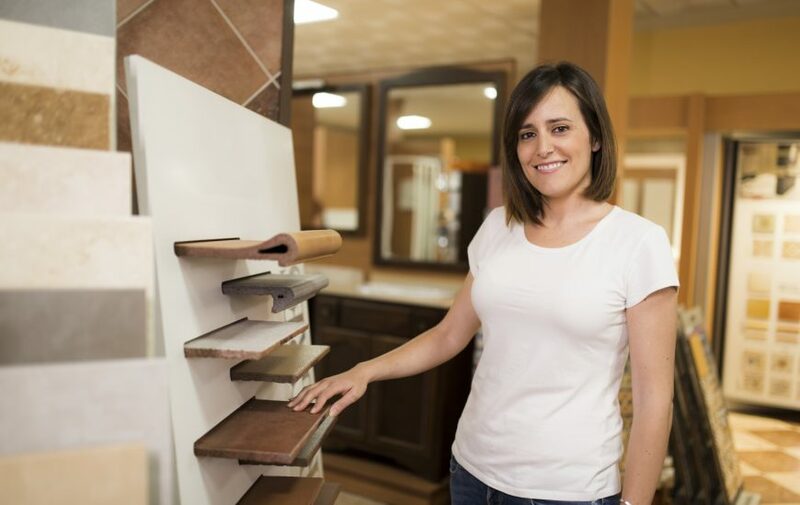 As the head of purchasing at Ross’s Discount Home Centre, I have many years of experience in dealing with indoor and outdoor tiles. Today, I will tell you what you need to consider when shopping for outdoor tiles in Perth. By following this guide, you’ll definitely find the perfect outdoor tile for your needs. Outdoor tiles are exposed to the weather elements all the time. While Perth does not experience a drastic change in temperatures, we do experience plenty of sun and rain. Therefore, you need to choose outdoor tiles that are durable enough to withstand prolonged exposure to both these weather elements. Additionally, outdoor tiles are more prone to staining. This is due to being overexposed to the sun’s UV rays, rain, dust, and wind. For this reason, glazed outdoor tiles are a better choice. Alternatively, if you choose unglazed outdoor tiles, you will need to apply a sealant to keep them from staining. The grip factor of an outdoor tile determines how slippery the tile surface of an outdoor tile is. The higher the grip factor of an outdoor tile, the more resistant the tile surface is to slip. You should always choose tiles with a high grip factor for outdoor use. R10 rated tiles are ideal for use in outdoor areas. Never use tiles with a lower grip factor outdoors as it will be a certain recipe for disaster. Even if you are using outdoor tiles in an area which is not prone to water exposure, you should always choose tile which is water resistant. When shopping for outdoor tiles in Perth, look for tiles that have a low water absorption rate. Such tiles are more resistant to developing cracks or stains. While some tiles are made out of naturally water-resistant materials, others are treated with a special coating for water resistance. Consider your needs, but always choose tiles that offer some amount of water resistance. Finally, when shopping for outdoor tiles, consider the colour scheme that you would like to use in your outdoor area. You can either choose to match the colour of your outdoor tiles with that of your house to give it a seamless look. Alternatively, you can also contrast tile colours with neutral colours to create a fun look. Where to find outdoor tiles in Perth? When it comes to finding outdoor tiles in Perth that feature all the qualities above, look no further than us at Ross’s Discount Home Centre. We offer an extensive selection of outdoor tiles, all of which are available in a range of styles, designs, colours and finish options. Our new range of wood-look outdoor tiles is a great choice for you to consider. These tiles offer the charm and beauty of natural wood, but they offer the strength and durability of a tile. Consider our Lignum Ebano and Timber Look Maroon wood look tiles which are perfect for outdoor use. These tiles are designed to retain their look and surface finish even several years after installation. When you’re out shopping for outdoor tiles in Perth, there are certain things you should look for. For outdoor use, always choose tiles which are durable and offer excellent stain resistance. Choose tiles with a high grip factor and low water absorption rate. Finally, consider the colour scheme that you would like to go with. For the biggest selection of outdoor tiles in Perth, visit our showroom at Ross’s Discount Home Centre. Our tiles are always in stock, and we also offer free delivery across Perth metro areas. Regardless of what style of tiles you’re looking for, you’ll definitely find it with us. Shop for outdoor tiles in Perth from our online store today!